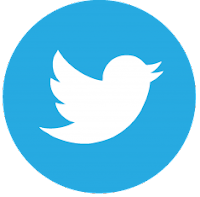 WARNING: This is a preview of Cultistorm. All components and rules are prototype and subject to change. Setup takes about 10-15 minutes. The board comes in five puzzle pieces. Put it together. 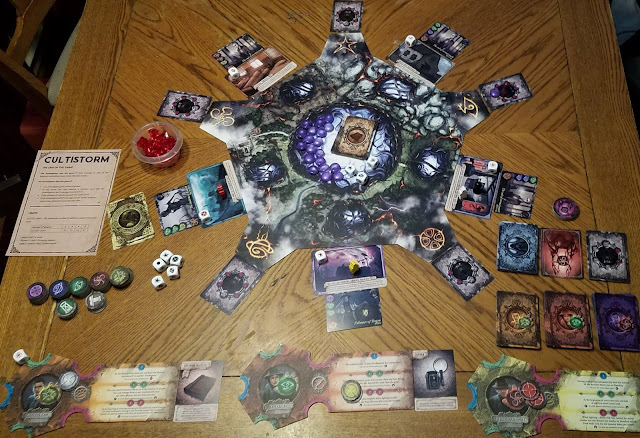 Shuffle items and place them in the center with the Terror tokens. Shuffle location cards and place one in each of the five slots around the board. 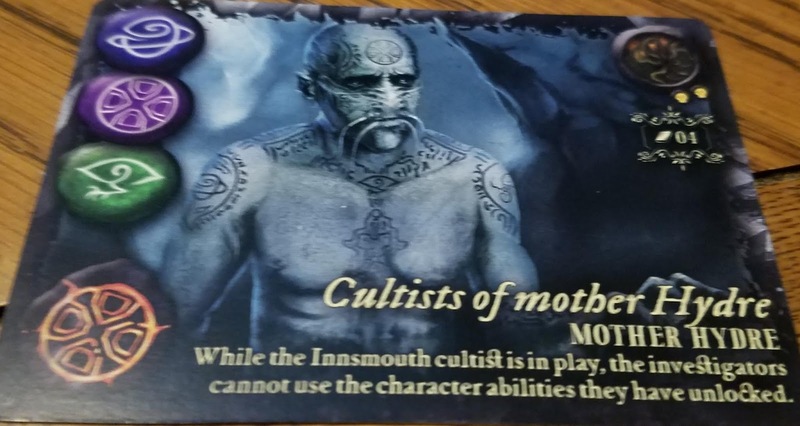 Pull out cultist cards marked with more skulls than you have players, and put them back in the box. Shuffle the rest and place one above each location. 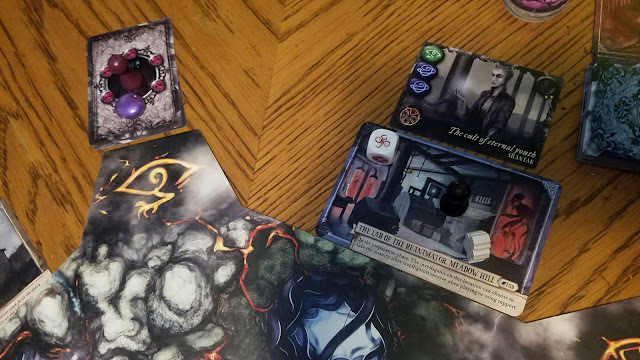 Terror cards come in two flavors: Horror and Final Act. Separate the two Terror types. Place one facedown Terror card at each of the five spots around the board. 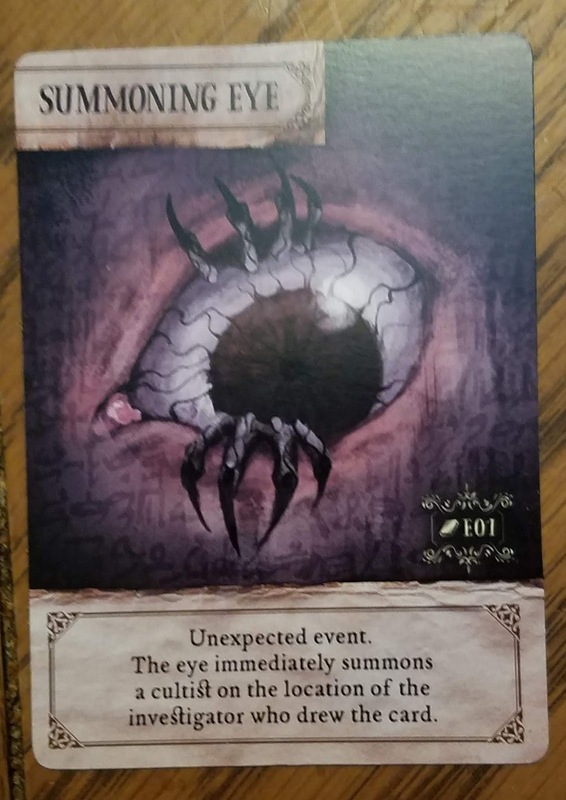 Place one Final Act card on top of the Horror above the eye symbol and place the Terror marker and one Terror token on top of it. The rest of the Final Act cards go back to the box. Choose characters and take the corresponding deck and player board. Place your character figures around the board according to age. Sort wave 1 and wave 2 Old Ones into separate decks. 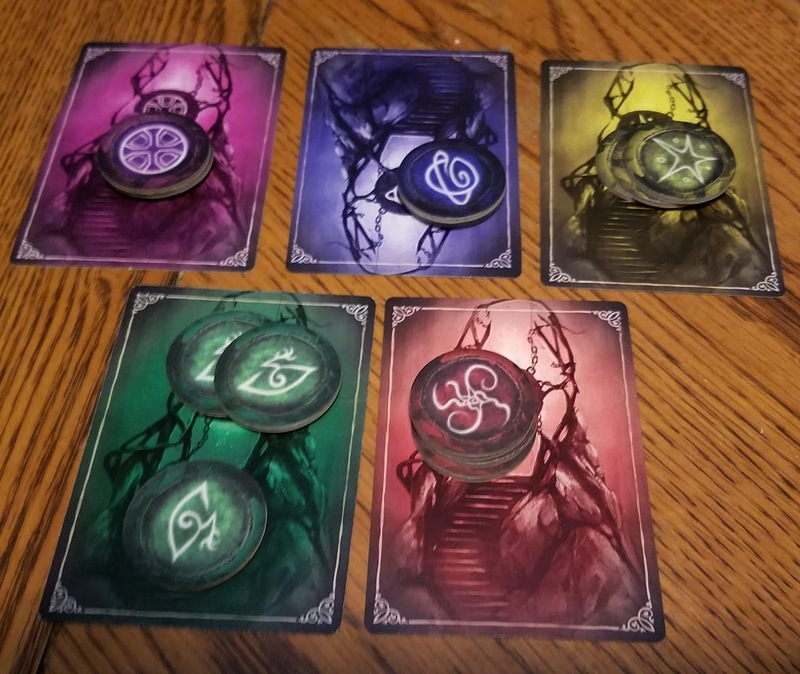 Place gate tokens, wounds, and decks within reach. Each player draws two items and picks one to keep. The rulebook is a work in progress, but the latest draft is pretty clear. 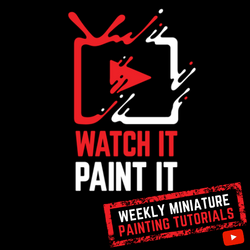 The rules and theme are simple, but there's a lot of stuff going on. Describing how all the mechanics connect sounds a little convoluted, but once you take it all in, it makes sense. I'm going to start with the goal and work backward, so bear with me. Basically, Cultists are trying to open gates to nasty places. Investigators are killing them, stealing their relics, and using them to seal gates. You seal gates in phase 6 if the player with the matching gate card is in a location with X trophies that also match the gate (X = Player count). Players can't generally trade/gift trophies, but anybody can place one on a gate at any time. When sealing, all investigators at that location lose sanity equal to the living Cultists there. 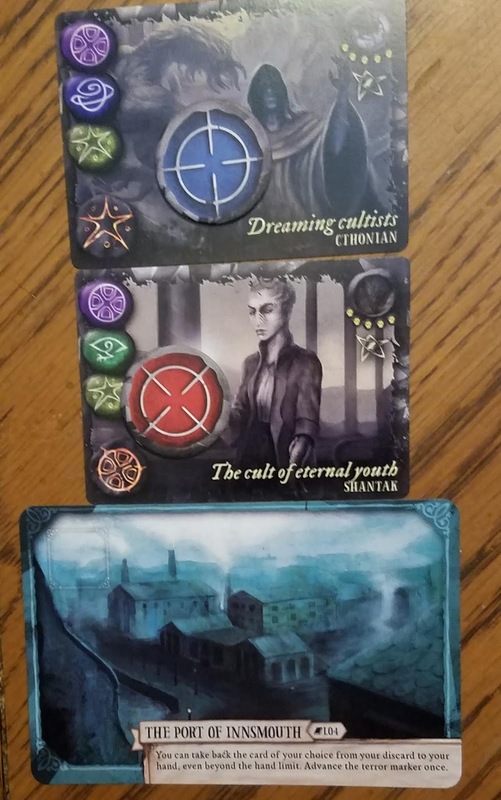 Locations consist of one gate, one Terror card (above), one location card, one cultist die, and however many baddies you haven't wrought justice upon. Each location has an ability that can be unlocked. Unfortunately, there's not much you can do to unlock them. 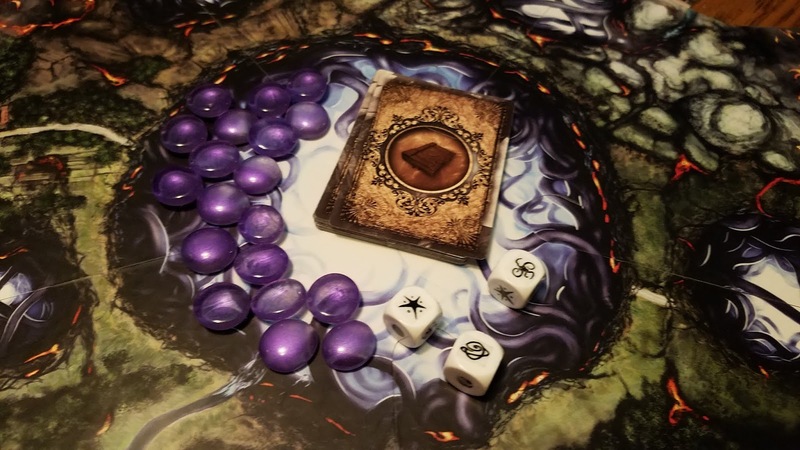 When the Terror marker makes it all the way around the board, you collectively choose one location to unlock and place a marker on it. Most games you'll only unlock 2-3. Investigators get trophies by killing Cultists during the Combat phase (5). When one is defeated, you gain the trophy matching the bottom symbol on their card. Kill Cultists by discarding cards from your hand that match the symbols on the left side. The top three are always required, the bottom one is only active if it matches the Location's gate. The Cultist die adds its symbol to every Cultist. So, every cultist is going to require you to match 3-5 symbols. Support cards, investigator dice, some actions, and some Location abilities can be used in this phase as well. During the Prep phase (4), Investigators will mark which cultists they are going after. It helps everyone keep the plan straight. This is an investigator card. You can use the bottom half to support another player in the Prep phase (4) or save it and use the symbol on the top during the Combat phase (5). If you support, you will often lose sanity, but it's frequently worth it just to get a different card in your hand. Each player deck has a few cards that don't damage your sanity and a few that will damage both investigators. 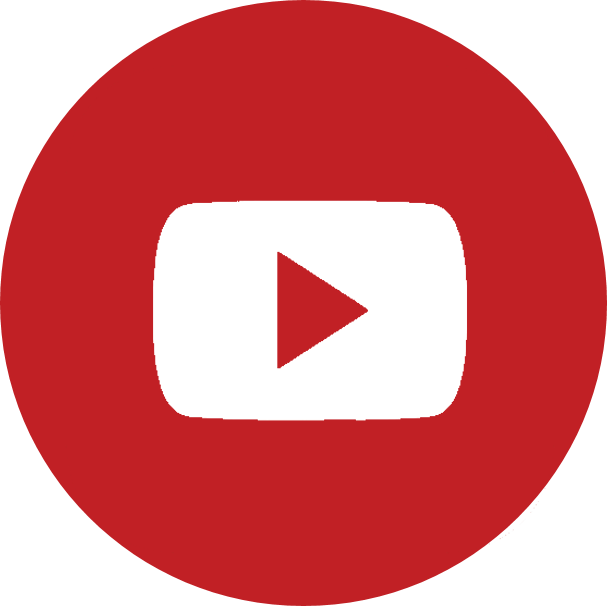 In the case above, the red symbol on the bottom right means that the supported player would also lose sanity when it activated. There are a lot of ways to become saner, especially if somebody plays the psychiatrist. Investigators also have a dice pool to draft from. You generally have the same number as players, but some things grant extras. By default, investigators can only draft one die per round. You can reroll your die, but it costs sanity to do so. Dice are rolled during the Refresh phase (3). This is also when you can discard and draw up to your hand limit. Item cards restore sanity, negate symbols, and remove terror tokens. 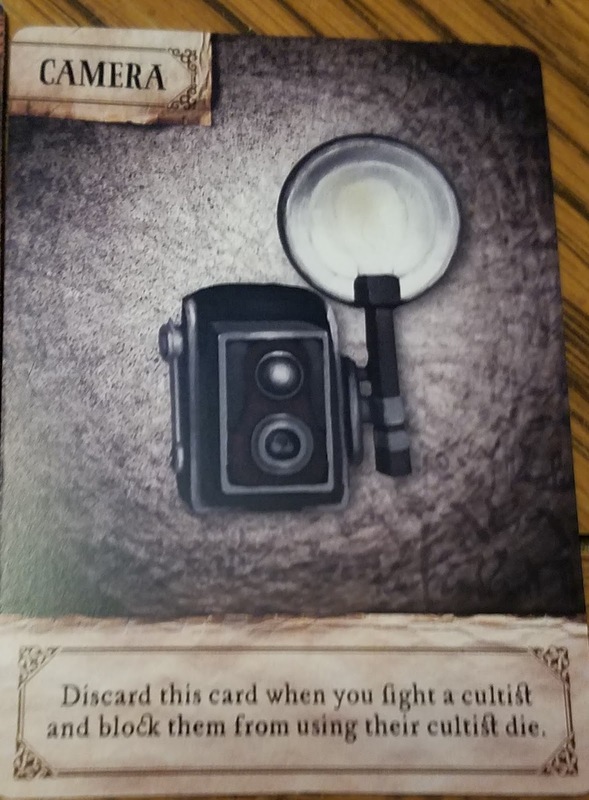 Each prep phase, every Investigator can draw items equal to the number of magnifying glass icons on the cards in their hand, and keep one of them. Most players have a limit of 2 items. Nothing is safe in a Lovecraftian game, so a few of the items you draw will have nasty cultist effects that must be encountered. These can really screw you if they hit at the wrong time. The mechanics are fairly simple. It becomes complex when you have to figure out how best to use your four dual-use cards to get the most done in a round. When you play a card, you generally get to draw a new one immediately. Some cards have a symbol that means you can't. Terror cards are a nasty little timer that you'll have to deal with. 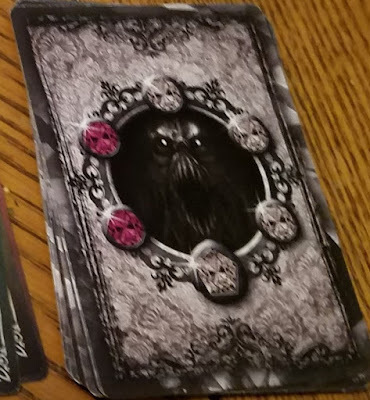 In phase 2, the Terror marker moves one card over, and a token is added to that card. 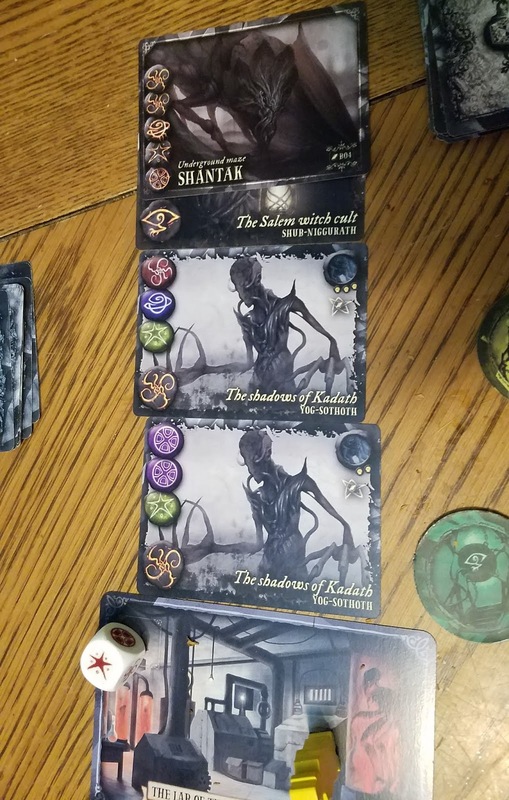 When a Terror card has tokens equal to the number of red symbols on it, it does something horrible. Maybe you just add a Cultist somewhere or lose a little sanity, but maybe you have to reroll blanks on Cultist dice for the rest of the game. Maybe it summons an old one. They're all pretty bad. A few things let you remove tokens, but a whole lot more will add them. Phase one is the Cultist Phase. 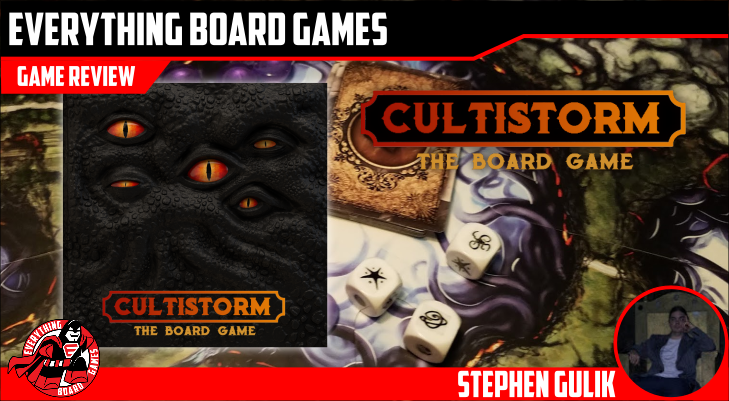 The Cultist marker moves around the board a number of locations equal to the number of players and a Cultist spawns in each location it enters. Don't let four Cultists gather in the same Location or an Old One will appear at the gate. At the beginning of every subsequent Cultist phase, it chomps the Cultist beneath it and gains the bottom symbol making it harder to kill. If the Cultist phase starts without a Cultist between it and the Location card, it enters our world, filling it with fishy doom. Game over. The character abilities are well implemented and have a good variety of options. Each character has a unique deck and three abilities that can be unlocked using trophies. The trophies slide into grooves around the player board. The caveat is that there are a finite amount of trophies and you have to have them to close gates. These go faster with a higher player count, so it's a lot harder with 5 players than with 2-3 players. Powers, locations, and items provide options, but most have additional caveats, generally adding a cultist, moving the Terror marker, or giving you sanity damage. You have a ton of options between the five locations, all the different Cultists with variable difficulty from round to round, player powers, unique player decks, unique items, dice, cards, and even story elements that affect the game. 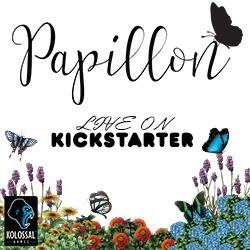 The Kickstarter will include a book of short stories, a book of scripts that are triggered by various cards, and even a soundtrack of original music. Most of that hasn't been translated into English yet, so I can't comment on the execution. The samples look very promising. This is a brain burner, mostly because of phase 4. Everything else is simple. Phase 1 - Cultist marker moves locations equal to the number of players, and a Cultist spawns on each location it enters. If a fourth Cultist is added to a location, also add the Old One that it worships. If there is already an OO in play, he gobbles the cultist beneath him. If an OO passes through the gate, everyone loses. Roll Cultist Dice. 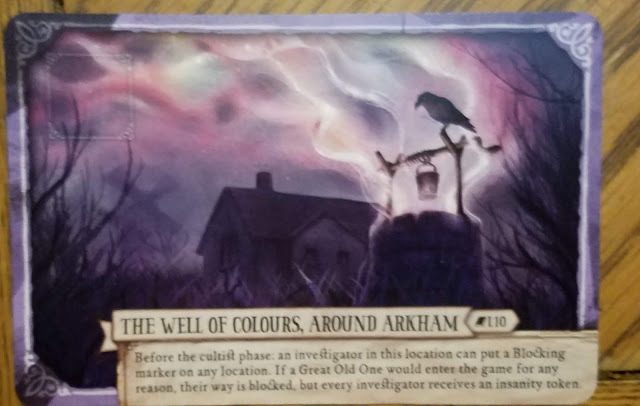 Phase 2 - Terror marker moves one space, and a token is placed on the new card. If the tokens equal the red marks on the card, it flips and does a bad thing. If the marker has reached its starting location, unlock a location of your choice. 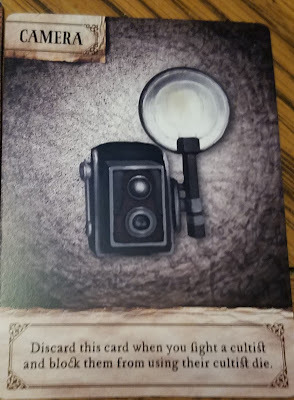 Phase 3 - Investigators can discard any number of cards and draw up to their hand limit. Roll Investigator dice. Phase 4 - Everyone simultaneously takes any of these actions, any number of times, in any order. B. Move to any location. You can move more than once, but subsequent moves cost 1 sanity. 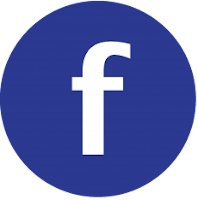 C. Use a location action. D. Search. 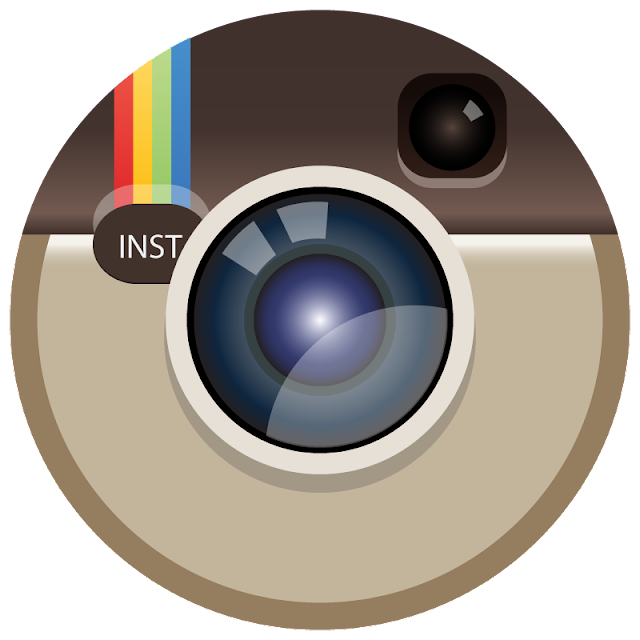 Draw Items equal to the number of magnifying glass icons on cards in your hand. Keep one. E. Trade or give an item to a player in the same location. F. Play an action card as Support. G. Gain forbidden knowledge by sliding trophies into the slots on your player board. This unlocks the associated ability, and you get any gate card that's in the supply. H. Choose targets and mark them with your tokens. I. Pass. Not really an action. When everybody's ready, you move on to the next phase. This phase is very interactive and conversational. You have so many options and so much is going on that it feels like an RPG. You're not just playing cards, you're planning a complex attack. It's really up to the players to keep things from devolving into chaos. Some people love this. Others feel it lacks structure. I'm in the middle. It's really neat. I love all the options, but mechanically it feels a little spongy, especially with higher player counts and more so if your friends can't stay focused. Mostly, I like it. 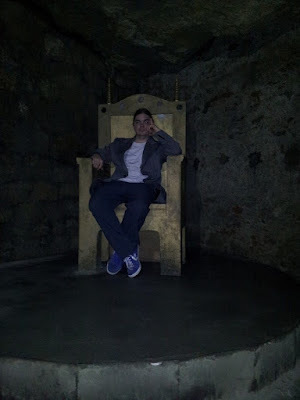 Phase 5 - Combat takes place. Play cards and dice to kill Cultists and take trophies. If you kill an OO, automatically seal the gate even if nobody has the gate card or trophies that would normally be required. Phase 6 - Close gates. If an Investigator is on a location with the corresponding gate card and X matching tokens (X = the number of players), the gate is closed. This is a great prototype. The board design is cool and imaginative. Cards are laid out well and even have symbols that tell if they manipulate dice or cards so you can find them without having to reread all the text on every card. Tight gameplay. I've never lost a game, but I've never won by more than a hair. There's a decent amount of variety in the base, but the Kickstarter comes with 12 expansions that add even more variety and increased difficulty. This offers a steep challenge, but there are enough mitigation options to mostly negate luck. Sometimes an unlucky thing will happen, but it's not one of those where the whole game hinges on rolling or drawing just the right thing. Cultistorm inspires deep, strategic teamwork. It almost feels like an RPG. I imagine the script book will add to this quality. I wish I spoke Czech. The art and design are great. Most games I've played have taken about 4 hours. I'm a little concerned that adding the scriptbook to what is already a pretty long game might push the playtime into a difficult area. There's a lot to keep track of already. "Wait, I could swear I had an eyeball. Where did it go? I know I could kill both of those Cultists. Where's that $&#^$*@ eyeball? Oh, I can negate all eyeballs by discarding this item. But there's only one eyeball symbol. Is it worth it?" There's a lot of that sort of thing going on in each player's head while others are asking for/offering support. It can get chaotic, but it's also part of the fun. It puts you in the shoes of an investigator who is lost in an onslaught on insanity and strange symbols, struggling to understand the magic necessary to combat incomprehensible forces of chaos. 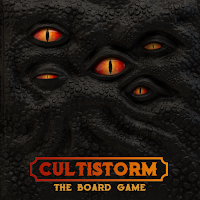 Cultistorm will burrow into your brain with a million squirming tentacles and twist your mind into unspeakable balloon animals. I love the amount of player interaction, the implementation of theme, the many layers of peril that you have to watch out for, and the myriad of mitigation options. However, in its current incarnation, the gameplay feels a little spongy to me. The openness gives it an RPGish feel, but also creates a chaotic, sprawling prep phase that feels like it needs a little more structure to bring out the full potential. If you like a game where you're juggling disasters in a spiral of ever decreasing options, you'll want to check this out. 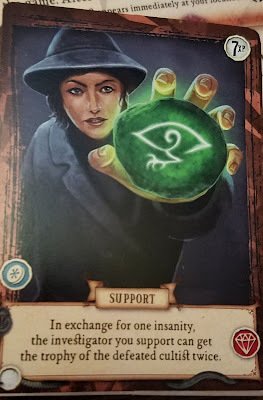 It's an excellent game for players who think Elder Sign is too luck-driven or who wish Eldritch Horror had more player interaction. It is also a brain-burner with a lot of options and conditions to keep track of. There's nothing casual about this. You focus, or you die. I wish I had a chance to play with the script book. If they nailed that, Cultistorm could be one of the most engaging Mythos games on the market. I don't know much about the expansions, but there are twelve of them so the game can be different every time you play. 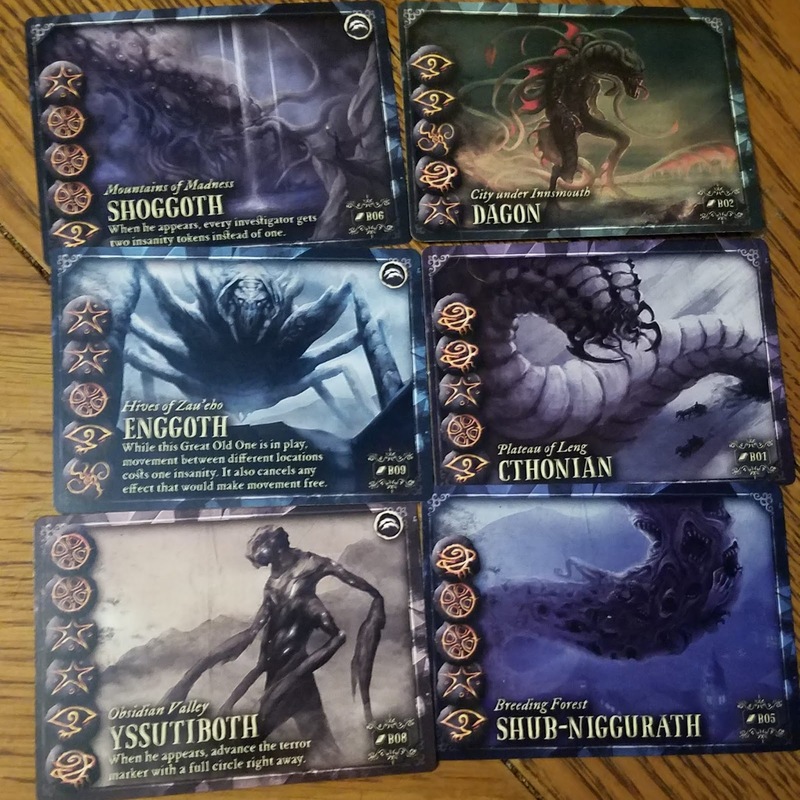 Intense player interaction, Mythos co-op, set collection, heavy theme, complex threat mitigation, caveats, beautiful dark art, variable player powers/decks, brain burners, minis.